In theater, there is the suspension of disbelief, that age-old technique of illusion to create a world of the imagination on the stage, to make you believe in the transformational qualities of character, place, and narrative. And then there is the opposite end of the performance spectrum, breaking the 4th wall, in which the illusion is shattered and the performer enters into our world, the so-called “real world,” the world of the audience, the public space. Last night at Woolly Mammoth here in Washington in a performance of American Utopias, Mike Daisey penetrated the public space in a way I had never seen, well of course it’s been done before – taking it to the streets – but perhaps not in such an ingenious way. After a nearly two and half hour non-stop monologue on utopic (and dystopic) conditions in America, from Burning Man to Disney World to Zucotti Park, Daisey invited the audience to follow him outside the theater to hear the conclusion of the story. He quickly ran up the aisle and out the back of the theater. Was this for real? Were we really supposed to follow him? Or was this a metaphorical statement, to follow the storyteller out into the world beyond the confines of the theater artifice to conclude the story for ourselves? To live our lives knowing that we do have control over reality, over the artificial utopias we participate in, that we can as individuals, change our perception of reality and thus alter the way in which we engage in social spaces that are full of contradiction. The audience obediently followed Mike Daisey, not knowing whether or not he would be waiting in the lobby to finish the monologue. The audience just kept moving, as one mind, bonded as Daisey pointed out, by its agreement to engage and participate in the ritual of theater. But now the ritual was moving outside to the sidewalks of DC. Still no Mike Daisey! 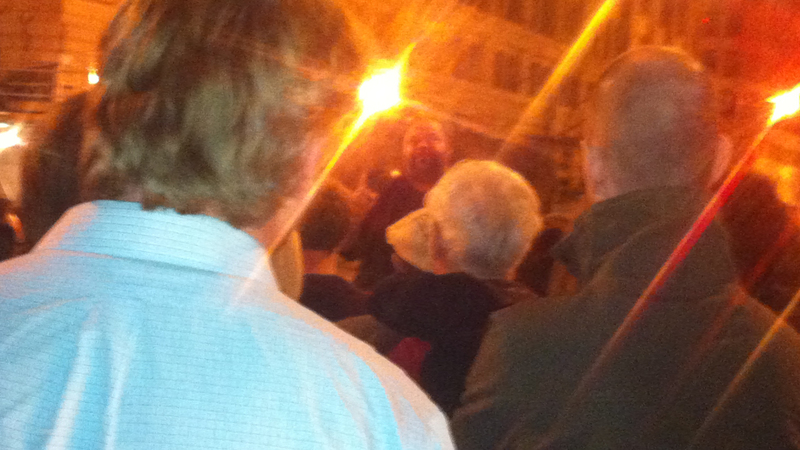 But then, the roaming audience arrived at the corner of 7th and D streets, and there he was! Holding court as we discovered, that yes, it was true, he was going to finish the story outside the precious parameters of Wolly Mammoth. It would become street theater after all. So Daisey concluded his work, American Utopias, by unveiling this ironic twist, that the real “utopia” was our ability to activate the social space in the real world, not in the theater, but outside where the course of real events unfold. Not as simulation behind the proscenium, not as suspension of disbelief, nor illusion, but as life itself. If in fact the artist represents a model for change and transformation, there is no better way to catalyze this idea then to demonstrate, without artifice, that theater is really a public action that no longer requires a stage. And yes, as Daisey pointed out, showing up is the crucial commitment an audience makes in the realization and activation of public space as theater, but that you can take this one step further, and bring that activation into the streets: where ideas become real action. Watching Mike Daisy organize an audience on the streets of downtown Washington, DC, the nation’s capital, was proof, living proof, that the artist really can change the world.